Enter the unique world of Taiwanese vegetarian cuisines at the Westin Chosun Hotel's Ho Kyung Jeon restaurant, and discover a variety of succulent traditional meat dishes with vegetables made to taste like chicken, beef or seafood. Relish this innovative and hearty cuisine bursting with marvelous flavors! With the number of vegetarians on the rise, the popularity of Taiwanese vegetarian meat dishes continues to grow. Ho Kyung Jeon's current special guest is a renowned master in this culinary field. 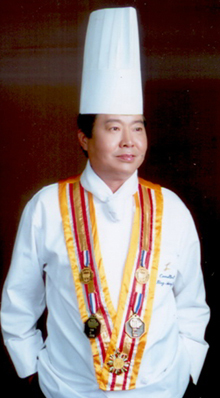 Chef, Mr. Chiu Ping Hsing, a former Executive Chef of the luxurious Attoppanting Hotel in Taiwan, and currently Vice Chairman of the Chinese Festival Organizing Committee is sure to grab the attention of gourmands in Seoul with his expertise. With an impressive 45-year career under his belt, he is now here to give Seoul a taste of his remarkable creations. Mr. Chiu Ping Hsing's dishes are abundant with fresh vegetables, especially mushrooms, since they perfectly simulate the savory taste and texture of meat. Try the Braised Kimchi and Sea Cucumber with Soy Sauce, Fried Mushroom with Paprika Sauce or a refreshing bowl of Mushroom and Bird's Nest Soup for a light and healthy lunch, or explore the exquisite dinner menu and savor the Sautéed Vegetable Shark's Fin with Crab Egg, Vegetable Ham and Green Bean with Endive or Noodle with Creamed Truffle. Only at Ho Kyung Jeon can you experience the delight of the Taiwanese chef's masterful creations, so come and indulge in the powerful flavors of these nutritious and luscious cuisines!